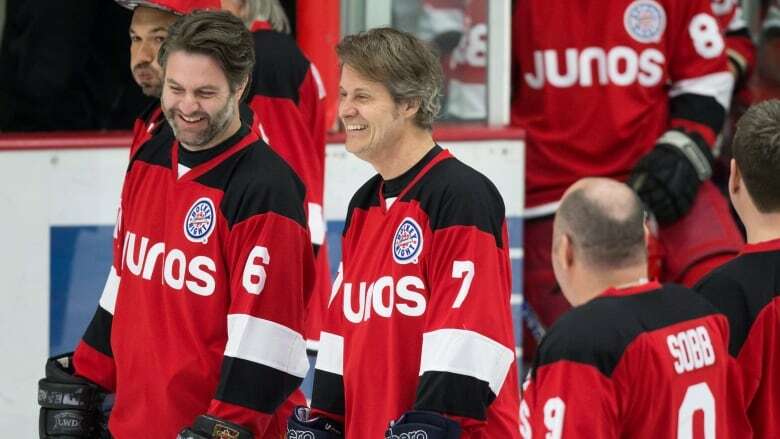 Hockey players Doug Gilmour, Gary Roberts, Natalie Spooner, Renata Fast and more go head-to-head with an all-star roster of musicians including Jim Cuddy (Blue Rodeo), The Reklaws and Classified at the Juno Cup this March in London, Ont. A pair of Canada's favourite pastimes — hockey and music — are set to come together at the Juno Cup in London, Ont., on March 15. The 16th iteration of the annual game will be presented by CBC Sports and features hockey players Doug Gilmour, Gary Roberts, Natalie Spooner, Renata Fast and others playing against an all-star roster of musicians including Blue Rodeo's Jim Cuddy, The Reklaws, Classified and more. "Juno Cup is the perfect kick-off to Juno weekend, with artists and players engaged in friendly competition for a great cause. We are all here to put musical instruments into the hands of children that need them most," said Cuddy, founder of the Juno Cup. The game will be played at the Western Fair District in London in an effort to raise awareness and funds for MusiCounts, Canada's music education charity associated with The Canadian Academy of Recording Arts and Sciences (CARAS) and the Juno Awards. Rounding out the hockey players' roster are Mark Napier, Sami Jo Small, Dennis Maruk, Dave McIlwain, Sarah Nurse, Mike Kostka and Brad Dalgarno. Former Montreal Canadien and Vancouver Canuck Brandon Prust will be the head coach. On the musicians' side, Adrian Sutherland (Midnight Shine), Amanda Rheaume, Barney Bentall (The Legendary Hearts), Menno Versteeg (Hollerado), Mitch Derosier & Luke Lalonde (Born Ruffians), Katie Munshaw (Dizzy) and more will also hit the ice.